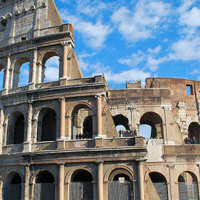 Rome has a neverending list of must see points of interest and to fit them all in would be to remain in Rome for years! The obvious monuments and sights that are most commonly are the Colosseum, St. Peters Basilica and Vatican museums, Spanish Steps, The Pantheon, Trevi Fountain and Piazza Navona but for those wanting to fit in even more Yes Hotel rome has created a list of major churches and basilicas, museums, piazzas, streets and historic sites that could be of interest to you during your stay in the eternal city. Upon arrival in Yes hotel rome maps will be provided to help you find your way around the city and our experienced staff are always on call for all of your queries and would be more than happy to indicate to you the best way to tackle the points of interest that appeal to you. Translated signifies the ‘altar of peace’, the Ara Pacis is considered one of the most important roman monuments. Built in 13 a.c to commemorate the reported victory of Augusto in Spain. It can be found in Piazza Augusto just off of Via del Corso in the centre of the historic centre, and consisits of a square of marble decorated by greek artists with an altar at the centre. The monument can be visited from 09:00 until 17:00 and on public holidays from 09:00 until 13:30. 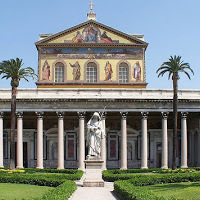 Erected in the 4th century the Basilica has undergone many changes during the years to bring to you today another of Rome’s most beautiful and magnificent churches in the eternal city. Located near Termini it is a 5 minute walk from the station or on the metro stop Cavour ( B Line direction Laurentina from Termini.) The whole creation of Basilica Santa Maggiore is based on a dream by Pope Liberio who during the night of the 5th August 356 dreamt that the Virgin invited him to construct a church wherever the next morning he found snow. The miracle came true as the next day it was snowing over Piazza Santa Maria Maggiore. The bell tower was constructed in 1375-76 and is the highes in Roma at 75 metres. Te inside of the Basilica has been maintained quite close to that of the original design, 86 metres long it is the proud keeper of wonderful works of art including that of D. Fontana who illustrates the Sistine Chapel for Sisto V. Entrance is free. The cathedral of Rome was founded by Costantino in the 4th century and it has been destroyed and reconstructed many times. On the top of the Basilica you will find 15 statues of saints each high 7 metres. The last door on the right is the ‘Porta Santa’ which just as with St. Peters is only open during the jubilee years. During the centuries many have added decorations and works of art, and in 1650 Borromini restored the inside in occasion of the Jubilee. 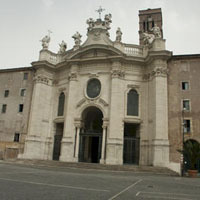 The imposing face of the Basilica which protrudes over the Piazza di Porta San Giovanni was constructed by Alessandro Galilei in 1735. The inside of the Basilica has a beautiful gold ceiling and holds many great artefacts including the remaining fragments of the much celebrated fresco of Giotto commemorating the Jubilee of 1300. A little out of the main historic centre the Basilica can easily be reached on the A line of the Metro (from Termini direction Anagnina). It is free to enter the Basilica. 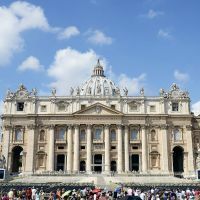 The second largest Basilica in Rome after St. Peters St. Pauls is 132 metres long and 65 wide and 30 metres high making it not only the second largest in Rome but one of the largest in the world. Located on the Via Ostiense, it is out of the main historic city centre but easily reached by Metro (Line B direction Laurentina from Termini). Erected by Constantino upon th tomp of the apostle Paul and expanded in dimensions by Valentiniano in 386 e then by Onorio in 395. Many great masterpieces were lost during the fire of 1823 but saved from the flames you can still see today the triumphant arch of San Leone Magno and the mosaics created in the 13th century by Pietro Cavallini for the face of the Basilica. The entrance is free. They don’t get any larger than the magnificent St. Peters cathedral located in the Vatican city. The dome can be admired from many angles of the city forming the spectacular roman skyline. Founded in 324 by Constantino in 1506 work began on the Bramante project which transformed the church into the splendid cathedral that can be appreciated today. Inside one can view the great works of Bramante, Raffaello, Sangallo of whom all worked on the church up until 1547 when Michelangelo sub-entered to create the inside of the dome, the largest work of wall art ever realised. The inside of the church is spectacular and visitors can feast their eyes on the ‘Porta Santa’, the large bronze door only opened during Jubilee years, the bronze statue of St. Paul by A. di Cambio with the right foot worn by the millions of pilgrims who kiss his foot, and la Pietà to name just a few. It also possible to enter the dome and the long walk up is well worth the amazing view that one can feast their eyes upon from up top, you literally have Rome at your feet. Entering the lower level of the Basilica you can view the tombs of the late Popes including that of Giovanni Paolo II who passed away in 2005 and who had a successful reign as head of Christianity of 26 years, the 3rd longest papacy in history. The church is free to enter. Constructed between 212 d.c and 217 d.c by the Emperor Caracalla located very close by to the Appia Antica (a street well known for it’s art and archeologgy) the Baths were in use right up until the 6th century when there was the invasion of Goti and the aqueducts supplying the water for the baths was destroyed. The Baths could host 1700 person at any one time in large baths of hot, warm and cold water. The entire structure was adorned with statues, frescoes and the finest marble. The swimming pools were surrounded by libraries, gyms and gardens that added to the relaxing environment. Open from 09:00 until 1 hour before sunset. The grandest of the roman baths these baths were of great luxury, exceptionally rich in decoration and style. The exterior was covered with carved stucco which gave a marble effect and the interior was adorned with coloured marble, painted stucco and statues. From 306 until 537 these baths were I use, closing only after the aqueducts that supplied their water supply was cut off by the Goths. Accommodating 3,000 bathers these baths were of particularly large dimensions. The baths today have been well restored due to the fact that it’s walls give also to the church of our lady of the angles and martyrs, a monastery and the national roman museum. Translated signifies the fields of the flowers. This Piazza located in the historic city centre is today a busy market by day for food produce and flowers and by night a lively place for the young being completely surrounded by bars, pubs, gelaterias and restaurants. 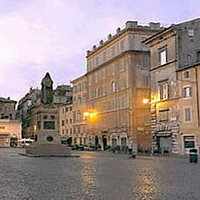 Campo dei Fiori is famous for the historic episode which saw the philosopher Giordano Bruno burnt alive after the catholic inquisition accusing him of speaking out questioning certain religious aspects. On the 17th Febryary 2006 of 1600 d.c Giordano Bruno met his death and today the execution is remembered with a statue erected in 1889 d.c and can be found right in the centre of the Piazza, instigated by the poet Pietro Cossa and created by the sculptor Ettore Ferrari. 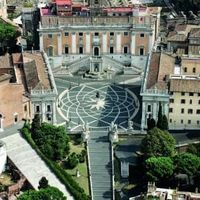 Probably one of the more interesting architectural sites, the Campidoglio is a piazza completely surrounded by buildings designed by Michelangelo. Situtaed on the Capitoline hill the Campidoglio has always been an important place for the life of the city first as a religious centre and secondly as a point of power for the organising of the senate. Today it is used as the headquarters of the city council. To reach the Campidoglio you can either walk up through from the roman forum or the main entrance being the long staircase. In the middle of the square you will find the famous statue of Marco Aurelio and to the left you will find the Capitoline Museums. The Capitoline Museums can be traced back to 1471 when Pope Sisto IV donated to the romans a group of bronze statues of great symbolic value, quite possibly making this museum the holder of the oldest existing public collection in the world. In the main museum you can feast your eyes upon the sculpture of the Dying Gaul and the busts of philosophers and poets as well as the dying gaul, opposite in the ‘Palazzo dei Conservatoi’ you will find the head of Constantine and in the Capitoline picture gallery a collection from the Sacchetti and Pio di Savoia collections acquired in 1748-50 also including works of Caravaggio, Guercino, Tintoretto, Carracci and Calvaert. The museums are open from 09:00 until 20:00 and closed on Sundays. 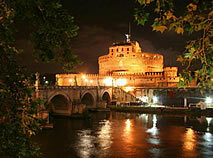 A spectacular castle alongside the river Tiber with a most impressing bridge leading up to the main gates, and at night is most impressive when illuminated. Constrcted by Adriano in 130 d.c with a tower being added in the 11th century. In 1277 the Castel became the property of the Vatican and papal apartments were added to the structure and within it’s long history has been used as a place of refuge for pope’s and prisoners with a secret passageway linking the castle to the walls of the Vatican city. Today it’s purpose is slightly less adventurous!, the Castle is home to the national museum where you will find a collection of weapons and documents regarding the history of the fortress. You have the possibility to go to all rooms within the castle walls including the prisons and the Popes apartments and many richly decorated halls and drawing rooms. The museums are open from 09:00 until 20:00 and closed on Mondays. 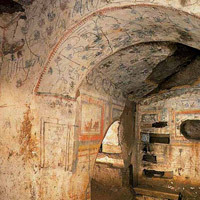 Considered the vastest catacombs of Rome, the Catacombs of Domitilla were first formed in the 3rd century and then amplified in the 4th and 5th centuries. As soon as you go down the stairs you will find the basilica of Saints Nereo and Achilleo erected in 390 on top of their tombs. This was restored after the earthquake of 897 when the building collapsed to it’s present state. Today you may enter the catacombs from the back of the basilica, these catacombs go on for kilometres across an underground gallery where many tombs have been dug out. 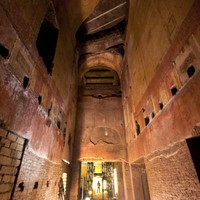 A fascinating place to visit and of all the catacombs in Rome certainly the most prominent in terms of dimensions. Open from 08:30 until 12:00 and 14:30 and 17:00 and is closed on Tuesday and during the month of January. Located at the top of a long staircase this church creates the perfect setting that is the Spanish steps. The actual church is easily distinguished by it’s 2 bell towers. Work began on the church in 1502 and was completed in 1519 whilst in 1550 the convent was also finalised, additions were made and in 1584 the new face of the church was completed by Giacomo Della Porta, whilst the staircase owes it’s beauty to Domenico Fontana. It is possible to visit the inside of the church where you can visualise great pieces of art including frescoes by Daniele da Volterra. In front of the church you will find the obelisk Sallustiano made of red granite and measuring 13,91 metres high. 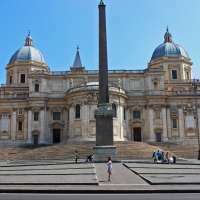 The obelisk was actually for centuries to be found within the Villa Ludovisi from where it was extracted by Clemente XII and brought to Piazza S. Giovanni, however it was never raised here and shortly after was transported to it’s resting place in front of the Trinità dei Monti. To the side of the Church of Trinità dei Monti you will find one of Rome’s top class and prestigious hotels the Hassler which hosts a constant arrival of celebrities and VIPS. 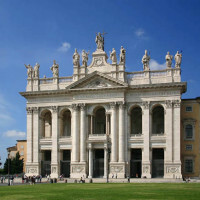 Created by Michelangelo this wonderful church can be found in Piazza Repubblica. The church was born in 1561 by the wishes of sicillian priest Antonio Lo Duca who was devoted to the cult of angels to whom he dedicated his entire life right up until his death in February 1564 a few days after the death of Michelangelo. At the time of the death of Michelangelo the work was not entirely completed but were continued by his apprentice Jacopo Del Duca with the main principle of the church remaining to dedicate 7 domes to one side and 7 domes to the other side dedicated to the martyrs. Since this time many have interpreted the destiny of the architectural structure of the church in their own way and in 1703 Francesco Bianchini inscribed the zodiac sign sonto the floor inspired by the great works of the astrologer Gian Domenico Grassini. In 1847 a new organ was installed and in 1864 a new altar was inserted replacing the original wooden altar, and in 1998 the council of Rome gave a new monumental organ designed by Bartolomeo Formentelli and in order to install this it was necessary to demolish the wall to the left of the organ. However even after so many changes and so many different interpretations still today we can appreciate the style of Michelangelo. Built in 1741 – 1744 replacing an older church, the church was consecrated in approx. 325 in it’s original state. The actual flooring was packed with soil from the Holy Land. Today you may note that the façade dating back to the 18th century is of Baroque style and to the side the ruins of medieval cloisters. Upon entering you will see the funerary inscription of Pope Benedict VII, a metric inscription in seventeen verses. The only remaining part of the old building is the eight columns made of granite, the pavement dates back to the 12th century and the wooden ceiling showcases a painting of St Helena Ascending into Heaven, painted in 1744 by Corrado Giaquinto. The church also holds the tombs of Cardinal Quinones (deceased in 1536), the relics of Sts Caesarius and Anastasius, and a beautiful fresco by Romano "the christ blessing". Particularly important dates for the church is the Discovery of the Cross on the 3r May and the Exaltation of the Cross on the 14th September. In this church which was designed in 1589 by Domenico Fontana you will find many masterpieces including those of Caravaggio. The national church of France San Luigi dei Francesi hosts the tombs of many French personalities. Entrance is free. 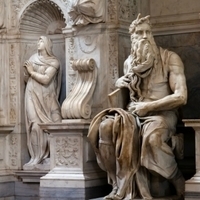 Located in this church is the Mosè by Michelangelo, amazing work of art of incredible beauty and expression. 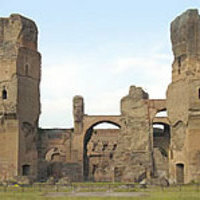 Constructed by Eudossia (wife of the Emperor Valentiniano III) and for this reason it is also called the ‘Basilica Eudossiana’. 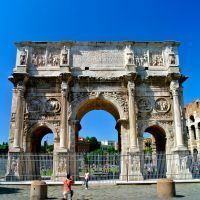 "Arco di Constantino" is the most important roman arch, created to celebrate the victory of the Emperoro ‘Constantino su Massenzio’ in 313 d.c. High 25 metres it is the highest of the 3 arches of triumph in Rome made from marble taken from old monuments and buildings in the city centre. On the walls of the arch facing the Colosseum you can see illustrated the battle of Marco Aurelio against the Daci and on the opposite side other battles by Marco Aurelio and Costantino. 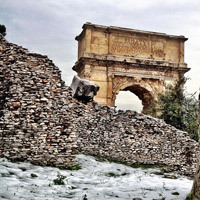 The arch can be found to the side of the Colosseum at the end of Via Sacra and marks the end of the roman forum. The Colosseum certainly speaks for itself! Probably the first thing to come to mind when one mentions in Rome is this magnificent structure with a history that will amaze and shock you as you take a tour around the insides of this well preserved wonder. Built in 72 d.c the Colosseum can be found at the bottom of the Palatine hills and at the end of the roman forum. The actual construction was instigated by the Emperor Vespasiano but the actual grand opening was not until 80 d.c witnessed by his son Tito. The purpose of the colosseum was to host large shows of Gladiators for the entertainment of the crowds, and over the years many a show of it’s kind evolved before the eyes of thousands of spectators. After this period the Colosseum ceased to be used and suffered a great deterioration until Pope Benedetto XIV blessed the church in the name of all Christian martyrs who fell to their death within the walls of this arena and in 1808 it was then restored by Pope Poi VII. Certainly not to be missed. Halfway down Via del Corso (the main shopping street in the historic city centre) you will find the column of Marco Aurelio located in the centre of a large square. 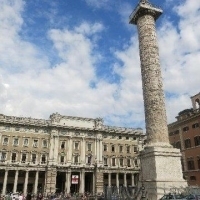 The actual column was built by the Roman Senate in memory to this emperor and it now stands in all it’s pride and glory at the very heart of Rome. In the same square you will also find Montecitorio Palace which is the house of Italian Parliament and the head offices of the Italian Republic. Tha actual design on the column represents the victorious battles of Marco against the germans, although for a long time it was believed that the Column was dedicated to Antonino Pio and called Antonina column! Composed of 28 rocks of white marble this monument is 41.9 metres high including the base. Now parkland with roman ruins situated below the Palatine hill this area was a hippodrome and mass entertainment venuw in Rome and still today is often used for large public concerts and celebrations such as New Years Eve and the great celebration of 2006 after Italy won the world cup! First used by the Etruscan kings of Rome as a location for public games and later in the 2nd century BC by the greeks, The Circus was expanded by Julius Caesar in 50 BC and after it’s completion the track was approximately 600 metres in lengh and wide 80 metres with the possibility to hold over 250,00 spectators. 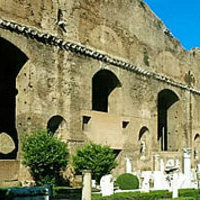 Additional amendments were made by the emperor Domitian who linkes his Palace up on the palatine hill to the Circus in order to better view the games and at a later date emperor Trajan expanded the area reserved for his seating while also adding 5000 seats also t better his visibility. Probably the most common sport showcasing at the circus was chariot racing with the immense space being an ideal circuit. 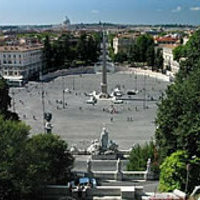 Today little remains that symbolises the history of this circus and important monuments such as the obelisk are now placed in Piazza del Popolo. Constructed under the order of the Emperor Nerone who desired an immense residence that would be the largest and most precious In the world housing the richest decorations and prestigious furnishings that could be found (leading to the name Domus Aurea ‘house of gold’). Re-opened on the 25/06/1999 the Domus Area an once again be visited and appreciated in all it’s splendour. The large rooms are adorned with frescoes and as you walk through the 32 rooms you may admire the Ninfeo of Ulisse and Polifemo and the rooms of the ‘Volta Dorata’ and ‘Achille Asciro’ for which you should allow in total at least 40 minutes touring time. Open from 09:00 until 19:45. 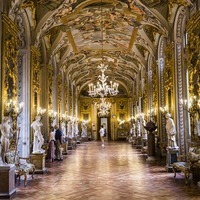 A great collection of private art this collection belonging to the Pamphili family boasts more than 400 paintings dating back from the 11th to the 18th century. The building itself dates back to 1435 and in 1601 the building expanded adding another courtyard and 2 side wings and in the 18th century Valvassori painted the main façade facing Via Del Corso and is considered his greatest masterpiece. The gallery includes over 400 paintings by Caravaggio, Tiziano, Lotto, Carracci and Algardi to name but a few. Open from 10:00 until 17:00. Thursdays closed. 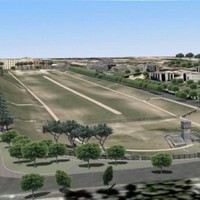 A wonderful area of parkland with an immense veranda overlooking the amazing eternal city below. Located above the ancient Trastevere Gianicolo is an oasis of calm and tranquillity and offers spectacular views, you literally have the city at your feet and can depict the Spanish step, Pantheon, Vittorio Emmanuele etc. ianicolo is actually the name of the hill itself high 82 metres and as well as being a great viewing bay and picnic opportunity you can also see the statue of Giuseppe Garibaldi and the statue of Anita Garibaldi. 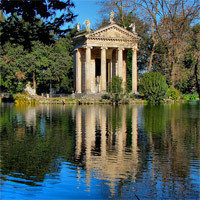 Immersed in the green splendour of Villa Borghese the entral park of Rome, the Gallery Borghese is home to a museum on the fist floor and the gallery on the first floor. In 1608 the idea of this building was instigated by Flaminio Ponzion to be finished in 1617 by Giovanni Vasanzio. The gallery is a vast and varied selection of some of the worls finest paintings by Raffaello, Caravaggio, Botticelli and many others beside. The museum itself also displays great treasures including the’venere vincitrice’ by Canova and an accumulation of roman sculptures. Open from 09:00 until 19:30. Monday closed. Known as the "Bocca della Verità" tourists are invited to place their hand into the mouth of the plaque and should they be a liar legend has it that your hand will be bitten off so be aware! This fascinating face can be found beneath the portico of Santa Maria in Cosmedin and the face in question is actually that of a Triton. 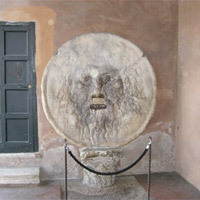 The legend derives from the middle ages when it was though that maybe this was the mouth of the oracle although by large it was used for submitting liars to the judgment of God. Should the culprit have told a lie then they would lose their hand when they placed it into the mouth, it is believed that the ‘judgment of God’ was helped by the judges when it was believed that a person was actually guilty! It is worth visiting to try it out for yourself! 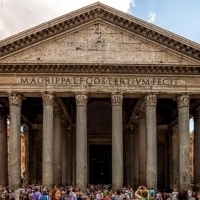 An amazingly immense structure, considered one of the finest roman works of architecture, the pantheon is one of the best preserved ancient buildings, constructed in 27 a.c. Located in Piazza Rotonda, the pantheon was transformed into a church by Pope Bonifacio IV, having been donated to him by the emperor Foca in 609. Probably one of the most particular features of the Pantheon is the hole in the roof!, from where the natural light can shine down on the insides of the building. The enormous bronze doors are also an incredible feature as you will notice upon entering the church. Apart from marvellous structural features the Pantheon is also the resting place of the great master of art Raffaello and Italian royalty. The outside of the building is just as impressive with 16 columns 14 metres high, a perfect photo opportunity! It is free to enter the Pantheon and is open from 08:30 until 18:30 and on Sundays from 09:00 until 18:00. Public holidays have a restricted opening time from 09:00 until 13:30. 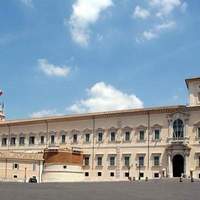 An enormously grand building firstly used as a papal headquarters to then be transformed into the official residence of the Italian royal family to it’s present state as the official residence of the President of the Repubblica. Built in 1584 in Piazza Quirinale under order of Pope Gregorio XIII this building is a compilation of work by various great architects including Domenico Fontana who designed the face and the dome by Carlo Maderno. Unfortunately it is not possible to enter either the building or the gardens and can only be admired externally for it’s large dimensions more than it’s architectural beauty. 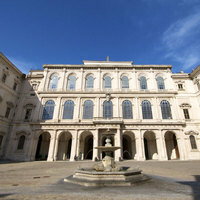 Easily reached by Metro A (stop Barberini) in the historic city centre this gallery of art holds many great treasures. Some of the more famous pieces of art showcasing include the portrait of Henry VIII by Hans Holbein, Maddalena by Piero di Cosimo, Madonna and child by Filippo Lippi, and Narciso by Caravaggio. The actual building was designed by Maderno and was built for Maffeo Barberini who bcame Pope Urban VIII. After the death of Maderno in 1629 Bernin continued the project with Borromini as a collaborator. The National Gallery of ancient art this splendid collection is definitely worth a visit. One of the most beautiful squares in Rome Piazza Navona is a must see in the historic city centre located close by the Pantheon and just across the street from Campo dei Fiori. The square itself is actually surrounded by Restaurants where you can experience a meal whilst enjoying the pleasant atmosphere. Outdoor eating is very popular in the square and even during the winter months heated gas lamps are provided. Located in the centre of the Piazza you will find many artists where you can have a portrait done or simply purchase some of the art work on display. 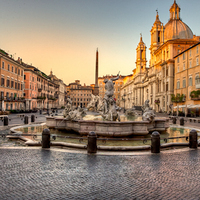 The modern day Piazza Navona is a great place to relax and saunter around enjoying the architecture that makes this square so idyllic, and as with all of Rome Piazza Navona has it’s own history. The actual shape of the stadium is that of an antique stadium, in fact in ancient times it was the stadium of Domiziano built by the emperor Domiziano in 85 D.C to be later restored by Alessandro Severo during the 3rd century. The actual stadium was immense and was able to accommodate over 30,000 persons. The design was lavish with many statues and the main purpose of the stadium was for athletic tournaments. Piazza Navona is an architects paradise with sculptures and buildings designed by the great masters of art such as Bernini (creator of the main fountain that you will find at the centre of the Piazza) Borromini and Rainaldi (creators of the church Sant’Agnese that can be found in front of Bernini’s fountain) and De Cortona who was the author of the frescoes displayed inside the Pamphili building. A must do whilst staying in Rome. A slightly more up to date monument compared to the remains of the antique Rome, this grand monument of enormous dimensions might not be the first thing that springs to mind when thinking about Rome but after a visit here it will be sure to remain one of the most impressive. Built in 1885 from a project by G.Sacconi to celebrate the 50th anniversary of the Kings reign this magnificent building I situated in Piazza Venezia. You will find that two soldiers are always on guard at the centre of the monument in front of the tomb of the unknown soldier (an unknown soldier who lost his life in the first world war). This monument also offers a great view of the Via dei Fori Imperiale with the Colosseum at the end. Open from 09:00 until 17:30 during the winter months and until 19:30 during the summer. An immense Piazza which is the point of meeting between 3 important roads in the historic centre, Via Del Corso, Via Del Babuino and Via di Ripetta. It’s features include the door of the people designed by Bernini which became the most important entrance to Rome for travellers from the north. At the centre of the piazza you will find the second largest obelisk in Rome, an Egyptian column dating back to 1200 a.c. From the piazza you can also climb up to the terraces of Pincio from where you can take advantage of one of the most spectacular panoramas of Rome. The piazza also holds 2 churches that on first sight may even seem dentical Santa Maria in Montesanto and Santa Maria dei Miracoli both created by Bernin in the 16th century. Making up one of the seven hills of Rome the Palatine hill is situated in the oldest quarters of the city with a spectacular view of the Circus Maximus on one side and the Roman Forum and Colosseum on the other. The palatine is high 70 metres and the myth states that it was upon this hill that Romulus and Remus were found and kept alive by the she-wolf. The children were supposedly brought up by a shepherd and his wife and once grown up Romulus decided to build Rome upon this hill. Excavations in this areas are continuos and each day we learn more about this ancient site and it’s inhabitants. Recent studies have concluded that there were people living on this hill as fa back as 1000 BC. Today it is possible to visit the Palatine and it’s ruins which include the palaces of Augustus, Tiberius and Domitian making it a large open-air museum. Every Sunday below Trastevere along the Tiber river you will find an immense market selling everything from fruit and vegetables to antiques, clothes and even animals! The best finds can be found early in the morning, but up until 14:00 you can roam around this incredibly large flea market. 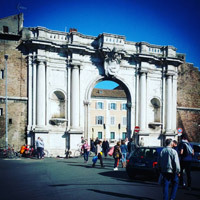 At the end of the 3rd century the emperor Aureliano decided to insert a door from which led the Via Portuense thus leading to this area becoming an important commercial meeting point, today this is symbolised by the varied market Porta Portese. 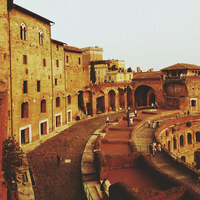 At the centre of the roman civilisation, the centre of the political and social life of the antique Rome. You can reach the Campidoglio alongside the building of the senate or passing by the monument of Vittorio Emmanuele II taking the Via dei Fori Imperiali. 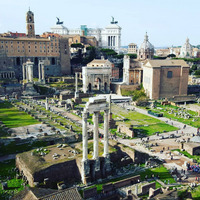 The Roman Forum was largely damaged by the barbarian invasion and in 1700 work began to bring back to the light the noted treasures and roman art hidden below the earth. 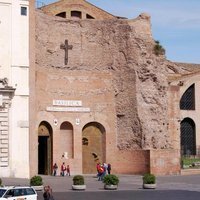 Within side the roman forum you will find the remains of the basilica Emilia erected in 179 a.c, the great arch of Settimo Severio constructed in 203, the column of Foca and the Temple of Vesta, Antonino and Faustina and the Basilica of Massenzio to name just a few. The oldest basilica of Rome it was erected in 222 d.c after which it was re-constrcuted in the 12th century by Innocenzo II. Located in the heart of the splendid Trastevere, a real roman quarter renowned for it’s small Trattorias and traditional roman cuisine, in 1450 the basilica was restored by Nicola V by the architect Bernardino Rossellini and in 1702 Clemente XI added the gallery designed by Carlo Fontana. 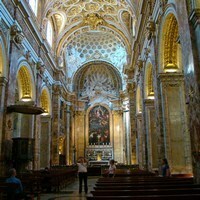 Inside the basilica betweem the windows it is possible to see the wonderful mosaics of Cavallini. Entrance is free. 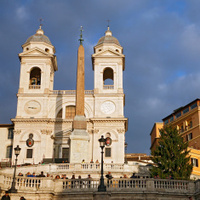 One of the most chic areas of Rome, the Spanish Steps are a located in a beautiful Piazza leading up to the famous church "Trinità dei Monti". Probably at their most scenic during the spring time when they are adorned with vividly coloured azaeleas, the Spanish steps are always a delight. In the actual square at the bottom of the staircase you will find yourself surrounded by some of the worlds most prestigious boutiques inclusing Dolce & Gabbana and Iceberg and the small cobble stoned streets leading off of this Piazza give way to even more exclusive shops and restaurants. To the left of the staircase it is possible to take a tea break at the Babbingtons tea room although many prefer to take an ice cream sitting on the steps. 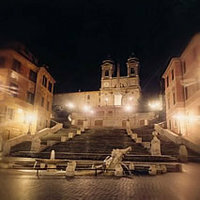 In general the Spanish steps are used as a meeting place. The large market place was constructed in the 2nd century d.c created by the architect Apollodorus of Damascus and this masterpiece represents the ancient equivalent of a modern shopping centre, consisting of 150 shops and offices. The shops were not as we are now used to and often the shop keeper would come out to the front to the serve the customer as the shop itself was too small to enter! This market could be considered the very first undercover shopping centre and can be admired from the the Via dei Fori imperiale on the opposite side from the main roman forum. Open from 09:00 until 16:30 in winter months and 18:30 during the summer months. 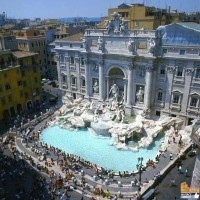 The most famous fountain in Rome. The Trevi fountain is beautiful by day and spectacular illuminated by night. Designed by the architect Salvi in 1735 a visit to Rome is not complete without a photo stop at one of the worlds most impressive fountains. Thousands of people visit the fountain everyday and throw a coin into the bottom of the fountain guaranteeing a return to the eternal city. The fountain was raised even more famous by Fellini’s film ‘La Dolce Vita’. In the centre you can see the statue of the ocean placed upon a platform in the shape of a shell pulled by horses. 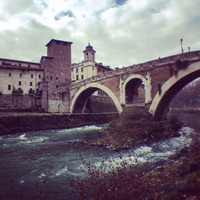 "Isola Tiberina" Is an island on the Tiber river in the middle of the historic city centre in the shape of a boat. The islands dimensions are 270 metres by 67 metres in width (the smallest inhabited island in the world) and was once the site of an ancient temple to Aesculapius, the greek god of medicine and healing. Although today the remains of the actual temple cannot be seen the island has maintained it’s traditionas as an island of the healing as today there is a large hospital situated on it’s banks which is linked by 2 bridges , one being the Ponte Fabricio (the oldest bridge in Rome dating back to 62BC. 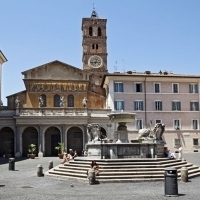 A fascinating zone of the city and definitely worth a visit, Trastevere depicts the real roman life and is a magnet for people looking for a real traditional roman dish in one of the many trattorias that line it’s maze of streets. Trastevere today is particularly popular with the young and students thanks to it’s many bars and cheap eateries but is a must see for all age groups and the atmosphere especially during the evning is particularly buzzing. Located in this area you will also find the Chucrh of San Crisogono which preserves the medieval mosaic of Pietro Cavallini and the church of S. Agata housing the famous statue of ‘La Madonna de Noantri’. The main square of Trastevere is Piazza S. Maria and is also home to one of the cities most prominent churches ‘Santa Maria in Trastevere’. The streets are also lined with market stalls selling arts and crafts and street entertainers, Trastevere certainly has a unique atmosphere and located a short walk from the Tiber river can easily be reached by bus or Tram No.8 from Largo Argentina. Located at the Spanish Steps this museum is actually the home of Keats and hos frien the poet Shelley whilst they were residing in Rome. "Rome is yet the capital of the world. It is a city of palaces and temples, more glorious than those which any other city contains, and of ruins more glorious than they." You will find the exterior to be identical to what it was at the time that Keats travelled to Rome. Inside there is an extensive collection of paintings, objects and manuscripts with reference to both as well as those of Byron. The extensive library which is dedicated to these romantic British poets includes a poem by Oscar WIlde and letters by Wordsworth, Browning and Severn. The house is visited by thousands every year and being so centrally located there is no need to miss out on this opportunity to take a step back in time and learn more about these two masters of poetry. 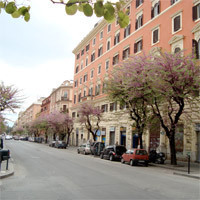 The university area of the city, this zone of the city is close by to the University of Rome ‘La Sapienza’ making it an ideal location for students. The area is full of restaurants, Pizzerias and Café’s frequented largely by the students and making it an ideal place for a good quality and an economic evening out in Rome. 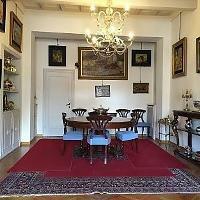 The area has maintained it’s original features and has a lively atmosphere. The largest collection of antiques in the world spanning over 7km with a huge selection of interesting art. 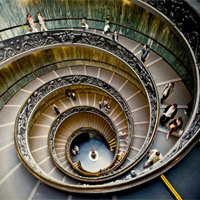 The new entrance was opened in 2000 on the 7th February by Pope Gioanni Paolo II, it is a large spiral ramp long 165 metres and inspired by the pyramid of the Louvre creating a one way entrance to the museums avoiding queues and added confusion to what is a heavily visited museum. The actual museums are developed over 4 floors over an area 10,000 square metres and the first nucleus of the museums dates back to the renaissance up until the present day that sees the Popes continuing to collect and select some of the worlds greatest treasures to showcase to the public. 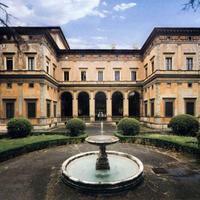 The museums house various departments beginning with the Egyptian section which has no less than 10 rooms, the rooms of Raffaello containing his famous frescoes and those also began by Bramante and then later completed by Raffaello and over 55 rooms dedicated to approx. 800 religious works of art and sculptures. The trip to these splendid museums is not complete without passing through the Sistine Chapel , which recently restored showcases Michelangelo’s great masterpieces. Open from 08:45 until 15:45 Mon – Fri and Saturday 08:45 until 13:45. Closed on Sundays except the last Sunday of every month when you will find the museum open and free of charge. Located in Via della Lungara Villa Farnesina was constructed between 1506 & 1510 the Villa was bought in 1577 by Alessandro Farnese hence the name of the villa. Surrounded by gardens that add to the harmony of the villa and grounds the building is of a simple design and the house holds many a great piece of art by Raffaello’s apprentices as well as his own celebrated masterpiece ‘Galatea’. For anyone looking to escape the hustle and bustle of the city centre can seek refuge at the Borghese Park located at the top of the Via Veneto and easily reached by metro (A line) Flaminio or Spanish Steps. The park is an oasis of green and houses a small lake full of turtles where it is possible to hire a rowing boat and the city zoo. 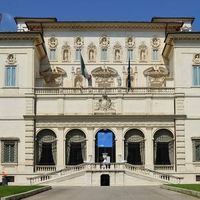 It is also home to the Borghese Gallery. The park also offers entertainment for children with pony rides during the summer months and miniature fairground rides and bar and ice cream stalls. It is the perfect place for a picnic and a chance to take a break from a heavy day sightseeing! In the heart of the city centre you will find the long Via Del Corso which runs from Piazza del Popolo right down to Piazza Venezia. This extremely lengthy street is perfect for shopping being completely surrounded by shops ranging from designer, high street fashion, elecronics, cosmetics and much much more. 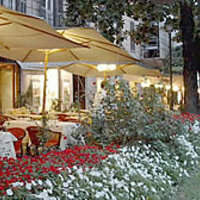 It is also along this street that you will find the beautiful shopping Gallery dedicated to Alberto Sordi and offering shops such as Zara and Guess and many side streets and piazzas located just off of this street offering more commercial options and places to relax with a cappuccino or take a bite to eat. Particularly bustling n Saturdays and during the Christmas period this is certainly never a quiet street! Probably one of the most prestigious shopping streets in the world, Via Condotti is a designer paradise with very chic stores with very nice prices! 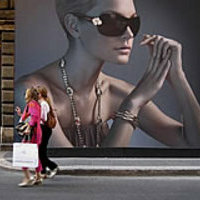 The selections of shops ranges from Gucci, Prada, Hermes, Salvatore Ferragamo and the noted jeweller Georg Jensen. 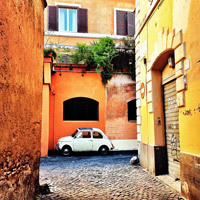 The street is situated off of Via Del Corso and ends at the Spanish Steps giving a spectacular view of the Church of Trinità dei Monti as you walk down this boutique lined road. Located off of Via Del Corso you will find a maze of further shops all carrying designer names such as Valentino, Armani, Chanel and Tiffany & Co. as well as a selection of Trattorias, wine bars and Café’s for a well deserved pit stop! The street is also renowned for Caffè del Greco, a trendy haunt among celebrities and politicians for a quick espresso short or a quick snack. La Dolce Vita! Via Veneto represents everything fine, posh and elegant. 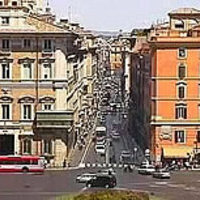 This sloping street begins at Barberini square and slowly winds up to the top where you will find yourself across the street from the Borghese central park. Via Veneto is home to the American embassy, the Hard Rock Cafè, some of Rome’s most sought after hotels including the exclusive Westin Hotel Excelsior and an array of bars and cafès including the famous Harry’ Bar which can be found at the very top on the left hand side. There is also many small jewellers and leather stores to feast your eyes upon. The street actually represents the good life of the 60’s and it’s character and charm has been maintained to offer today the same refined and relaxing atmosphere.